I was doing the washing up last weekend and Desert Island Disks came on the radio. It was Neil Tennant from the Pet Shop Boys and he was talking about the first piece of classical music that had affected him – Vaughn Williams’ Fantasia On A Theme By Thomas Tallis – and where he’d heard it first: in the rather boomy school hall where he had his music lessons. And this reminded me of how, when I was about 10, I would play in our back garden. Not on the lawn, but in the vegetable patch. I’d take our old radio down there, so old-fashioned I can’t even describe the strange artificial fabric that it was wrapped in, and a huge dial, and thick buttons like segments of Callard and Bowser’s treacle brittle. It was a summer evening, the sky was red – and from the radio came a music… a music that hypnotised me, stopped me in my tracks, changed all the colours in the sky and in the garden. I don’t know what that music was; I missed the announcer giving the title. For the remaining evenings of that Indian Summer I would go down to the canes of loganberries and the empty rows of earth waiting for seed potatoes, and I would tune that old transistor to the Third Programme and hope. But the music never returned. Or if it did, the effect it had on me was not the same. But as I listened each evening, and hoped, I would push my toy cars and tanks, and my golden James Bond Aston Martin, through a landscape of bone dry, crumbling clay-red soil that would rise up in clouds of dust that matched the sunset. I would lie down in this landscape, with the side of my head to the soil, my eye almost to the ground and – that close up - the dry lumps and ridges of my Dad’s gardening looked like mountains in a Nevadan desert. Somehow, unintentionally, I’d turned that music into a landscape. I’d made the feeling, a feeling that I would never recapture, into a map. And all maps have those two elements. They represent something of the physical shape of another place, but also of the feelings about it. Those army mapmakers in the 1920s who sneaked the outline of an elephant among the contours of a hill on a map of The Gold Coast – they weren’t too tired to be bothered to climb the last hill, as some commentators have suggested – I think they were acknowledging that there was a little more to that country than contours. We’re here today to celebrate a map – one that does have places on it, there are routes that you can follow, but just as important, it’s an attempt to express some of the feelings that hang about those places: their atmospheres. And to encourage people to explore routes that they can discover, and find their own feelings there. Now, I’ll come back to the Atmospheric Maps in a while and then we’ll all have the chance to see them and take them away. But before then, with your help, I want to very quickly make a map here. It might overlap a little with the Atmospheric Maps. It is also a Teignbridge map. I’m making this map in a very unscientific way – I’m using some odds and ends that I found lying about on my office shelf, up in my loft. Things I’ve picked up on my wanders. I’ve got a plastic crab here, and a piece of tarmac, and a pirate and some sand. This sand is to remind me of the very end of Dawlish Warren. Right opposite Exmouth. It’s an odd place, because it can feel very bleak and isolated on the end there - the sands are smoothed by the wind, the bones of fish are bleached by the sun. And yet at the same time you also feel very close to the houses on the other side of the water. And it’s deceptive in another way: it wouldn’t be difficult to feel that this is how the place has always been, largely unaffected by human agency. In fact on the end there one is standing on the graves of Dutch soldiers, on the site of a Civil War fort and, sixty or so years ago you would have been standing among a community of nearly 50 buildings. A community built, against biblical advice, on sand – a kind of weekend utopia for Exonians, without mains, without sewers, without political representation, without laws and, as far as I can tell, without crimes. All, eventually, swept away by the sea. But then everything in the landscape moves – even the mountains in Snowdonia move at about the width of a fingernail each year. 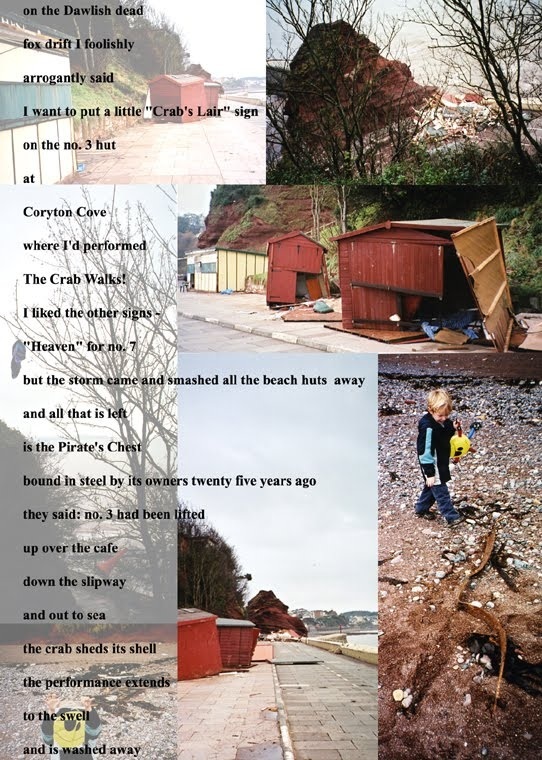 The beach hut in Coryton Cove where I performed my Crab Walks moved a lot quicker than that. 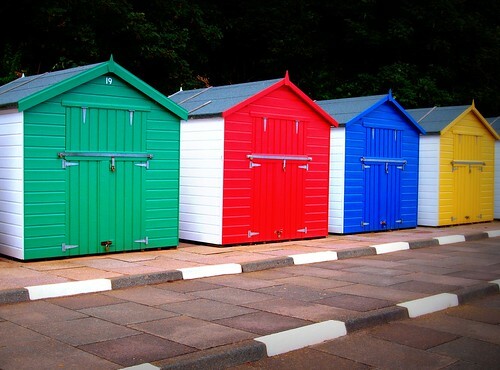 The day after some storms I heard the beach huts had been affected and I went down to the Cove, passing myself off as a beach hut owner to get through the barrier. No 3 hut wasn’t there at all, not even fragments of it. Someone there claimed to have seen the whole hut lift off and fly over the Pirate’s Chest café. Bob who owns the Pirate’s Chest was there was sweeping water out of the café. The least we could do was give him a little trade, so my son Daniel bought a pirate. This isn’t the actual one – Daniel’s was an inflatable one. He lived with that inflatable pirate for a year – it went everywhere with him – the best value I ever got out of £1.50! After we got home I put together a collage of photos of the remains of the huts, and I sent it by e-mail to friends and fellow explorers around the world. Creativity comes out of chaos. There is a kind of beauty in that melancholy, Phil. It's like the bits of the hut are washing round the world!! And in a way, by e-mail as well as water, they were. Can I have that piece of tarmac, please? Thank you. I found this on the Shaldon bank of the Teign. It had come all the way across from the car park on the Point on the other side. Waves had torn up the whole surface of the car park. But it’s not to remind me of the impermanence of the landscape, instead it’s a token of the constancy of things maintained. For the route this must have taken across the river is the same as the ferry there has been taking for hundreds of years. I love to take the ferry. One of the ferrymen always makes me walk sideways up the boarding plank – I have to be the “crab man” for a moment. And I enjoy the skill with which the ferrymen negotiate the currents. The chequerboard livery of the boats is a kind of stubborn geometry, a reminder of the serious game the ferrymen are playing, and a secret nod that for those brief minutes on the water we are a group of strangers made brothers and sisters by the ritual of the crossing. Now we are developing a little bit of a route here – from the Warren, through Coryton Cove to Teignmouth and Shaldon. Not dissimilar to the route of the devils’ footprints in 1855, when the people of South Devon woke up to find the snow on the ground and on their roofs pitted with mysterious marks – some said they were the tracks of a Kangaroo escaped from a menagerie, others a goose wearing horseshoes, others still said it was all the fault of high church vicars and in this little piece of pulp fiction ‘UFO 517 – by Bron Fane – who is, in fact, the Reverend Lionel Fanthorpe writing under a pen name – the marks were left by the deadly laser guns of sinister time travelling aliens. And yet none of these strange beings – geese in clogs or evil Negons - can quite compete with the oddness of crabs. This is a Shore Crab – (LARBE PLASTIC MODEL OF SHORE CRAB) - of course, they don’t actually grow this big! Now this doesn’t represent a place on the map - although if you want to see big Shore Crabs you could do worse than the Point at Teignmouth at low tide – no, this represents a way of thinking. You see, the Shore Crab does an extraordinary thing – when it’s on land it spits out water from the points where its legs connect to its shell and then passes the water around the knobbly edge of its shell – some of the smaller ones can pass it right over the bumps on the top of its shell – these bumps and knobbles agitates the water, allowing oxygen from the air to get into it… and then the Shore Crab takes the water back inside itself – and retrieves the oxygen – sustaining itself out of water. This is a guide for how to use ideas when you’re walking – let your ideas move around you as you walk. Allow them to be agitated by what you find. See how your experiences change them or refresh them. I read a theory the other day that ghosts are created psycho-demiurgically – they appear in former places of performance or worship, because they miss the people coming to give the places life – so these appetites, this hunger haunts old theatres, ruined churches, grand halls – waiting for some visitor on whose energy they can feed. No, that didn’t happen, but when Polly pulled the stick out, it had snapped beneath the surface. OK, here are the last markers for our map and then we’ll be done: a piece of coal, some plastic breasts and an eye. O, yes, and a tennis ball. The ball is to remind of a performance of Crab Steps Aside that I gave on the former tennis court of Charles Babbage’s house at Teignmouth. In the audience was Bianca Mastrominico, the daughter of a famous Neapolitan acting family. Ten minutes from the end I saw an expression of pain cross her face. Now, I’m familiar with boredom, distraction, irritation – but not inflicting actual physical pain on the audience, so I asked her what had happened. She’d been stung on the foot. At first I thought it might be a snake, but we found the wasp. Despite having to suffer the last ten minutes of the show in some discomfort, Bianca and her partner John Dean, invited me as a representative of Wrights & Sites to make a workshop with actors in Naples. So here’s a wormhole in our map of Teignbridge – from Babbage’s tennis court to the Palazzo delle Arti Napoli. 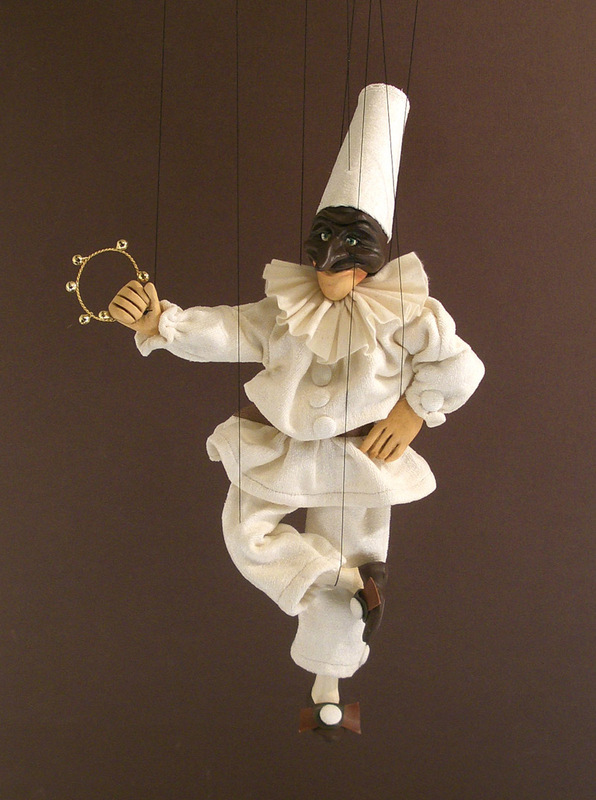 This is the trinket of Pulcinella that I bought in Naples – he’s the symbol of the ordinary people of Naples. I’m not sure how good a model he is for our walking, for he tends to assume the world is just the same as he is. In England we call him Mister Punch. At this point I have to make a rather serious confession about the Maps. On our atmospheric walk in Newton Abbot, among some modern houses we found an oak tree – identified by the more knowledgeable among us as a sessile oak, with its characteristic stalkless or sessile fruit, bunched on the twig. I wanted to refer to this sessile oak in the Maps and, not knowing how to spell “sessile” I typed my first guess into Google – C – E – C – I – L – E (gap) O – A – K - so the fact that it is spelled Cecile Oak I would like to blame on “World Of Stock”, “Photographers Direct”, “The Slieve Bloom Experience: Walking Holidays in Ireland” – and a wiccan suggesting it as an offering. The only good thing about my mistake – for it is my fault, of course – is that I have accidentally brought a new person into the world. And I suggest in future that whenever you walk you take her with you – Cecile Oak – for she’ll show you the density of detail and texture that is all around you. The hidden slipway at Starcross. The stiff-legged-ness of the deer, ready for a swift getaway. The piece of broad-gauge rail hidden in the fence. The pair of plastic breasts, left – appropriately – on Mamhead Hill. The coal on the beach. Actually, this piece of coal is from the very last wagon of coal to be brought up from the famous Maerdy pit in South Wales. But I’ve it brought here because it reminds of the wrecked boat I see whenever I travel to Teignbridge on the train. It was called The Coaster, sunk in the Exe in the early 1940s while fleeing a German U boat. Its cargo of coal was, reputedly, shared among the locals, for people on the Warren would find pieces washed up on the beach. 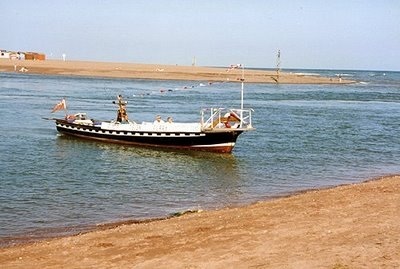 A precursor of Branscombe, and the ship beached there – called “the Napoli”. The coal is also a reminder of the trains that succeeded Brunel’s atmospheric-powered railway – and to take us on one of their journeys I’m very pleased that we’re joined today by Platform 9 - Newton Abbot's community music, theatre and heritage group who are going to sing for us their song about a journey from Newton Abbot station: it’s called ‘Platform 9’. The railway line in that song closed to regular passenger trains in 1959. I wonder if railway lines, like abandoned places of performance, get hungry. The opening shots of the 1941 film The Ghost Train were filmed on the railway track between Dawlish and Teignmouth stations. Arthur Askey has dropped his hat out of the window, pulls the communication cord and runs back down the track to retrieve it. For those of us who know the geography, there is a jolt as the trains seem to stop just as the track bends into Teignmouth station, and then in the next shot has leapt backwards quarter of a mile. It’s a sensation that’s even more intense in Norman Wisdom’s Press For Time in which the centre and outskirts of Teignmouth are chopped and changed as Norman commandeers a bus to chase his stolen bicycle. This playful rearranging of space is something that anyone can indulge in - simply use the last symbol on our map. Your eyes. (TAKE THE EYE.) Because I’ve sought out some of the films made around here over the years, for me their traces bathe certain of their locations. But you can be your own film director – use your eyes as cameras, film new stories, jump cut from view to view. For this is the ideal place for your film-making. For this is the lost Hollywood – Watcombe Hall was its studio, where in 1926, among many other productions, they filmed ‘Where The Rainbow Ends’ – the story of two impoverished upper class children, separated from their parents, who call up St George to free them from the horrors of their greedy middle class relatives, and fight the Dragon King (a lightly disguised Bolshevik). At the time of its filming it was as popular a Christmas entertainment as ‘Peter Pan’ – and it is the obvious model for C. S. Lewis’s The Lion, The Witch and the Wardrobe.